I first came across Mother Jumpers on Facebook a few months before the jump was to take place. It immediately caught my eye as a great way to do something adventurous that I’d always wanted to do while helping those in need at the same time. I did some more research into Support For Mums and knew that this was an organisation I wanted to help. I luckily had no issues with my pregnancy or birth and have very supportive family and friends, but I can understand how difficult it would be to go through this experience alone. Coming across Mother Jumpers quite late, I was worried that I wouldn’t be able to get enough donations in the short space of time before the skydive was to take place. I needn’t have worried, as family, friends, colleagues, local businesses and patients at the hospital I work at were very generous in their donations. I quickly surpassed my target and was overwhelmed with the support I received. As the day got closer, I became more and more excited about the skydive. My kids were excited too, although at 2 and 4 I don’t think they really understood what crazy feat mum was going to do! The day of the jump was grey and I hoped that it wouldn’t be cancelled. My husband and two children took me to the drop zone and we’re going to be waiting for me to land. 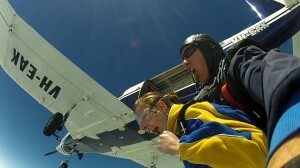 It was seriously one of the best things I have ever done! I was so excited and couldn’t wait to jump out of the plane. Everyone in the group was excited, if a little nervous, and it was nice to have a couple of other Mother Jumpers in our plane load. The free fall was amazing and it was such an adrenaline rush. Once the parachute was up, I could appreciate the gorgeous view above St Kilda and just how high up I’d been when I jumped. My husband and the kids were down below when I landed and were almost as excited as I was. I couldn’t wipe the grin off my face for the whole day. Even now when I think about it or look at photos or the DVD, I get a great big smile on my face. 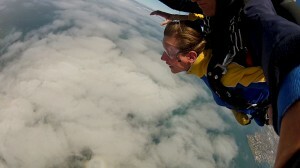 I’m so glad I had the opportunity to step out of my comfort zone to do this skydive. It was a wonderful experience for me personally and a great way to help Support For Mums in a unique way.